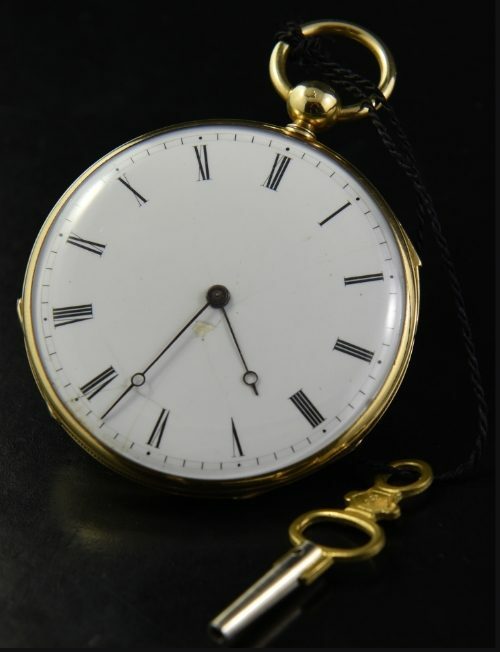 Home / Shop – Vintage Watches For Sale Used & Antique / Available / Henri Robert quarter repeater pocket watch 18k. This is an approximately 200 year old Henri Robert 18k. solid gold 45mm. quarter repeating pocket watch. The original porcelain dial does have a crack as you can see-but remember the age of this watch. The movement was just serviced and functioning perfectly, with the chime being crisp and clear. The winding key is included. The 18k. solid gold case looks lovely. This really is a beautiful watch. $3950.